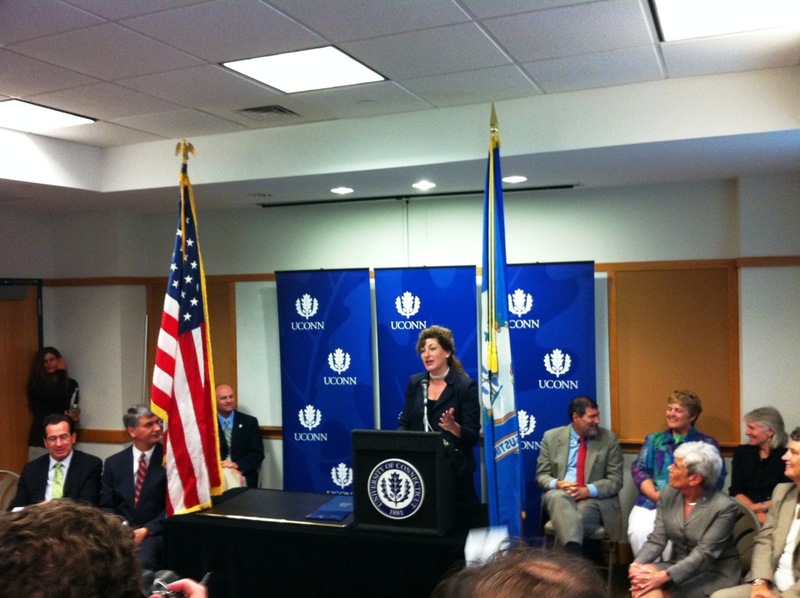 Last week – as hurricane Irene was beginning its journey up the east coast, I spent some time with the faculty at the University of Connecticut (UCONN) to hear all the exciting things the university was up to since my graduation from the School of Engineering in 1989. The campus has grown tremendously in the last two decades with buildings seemingly coming out of the ground wherever you look. I had a discussion with Reda Ammar, Ph.D, Professor & Department Head of Computer Science & Engineering, Don Swinton, Development Officer of the School of Engineering, Kylene Perras, Program Director, Leadership Giving, School of Engineering & Heidi Douglas Director of Engineering Alumni Relations I came away highly impressed with the progress the university has made. I also had a chance to speak with Mun Choi, dean of the School of Engineering, a man who I have heard great things about and was honored to meet. I learned the school is involved in a whole host of advanced technologies such as information security, networking and bioinformatics and is receiving millions of dollars in research funding. Moreover, the University is focused like a laser on finding jobs for students and is working with companies of all sizes to pursue joint research and even work to make a business out of idle patents companies have in their portfolio. 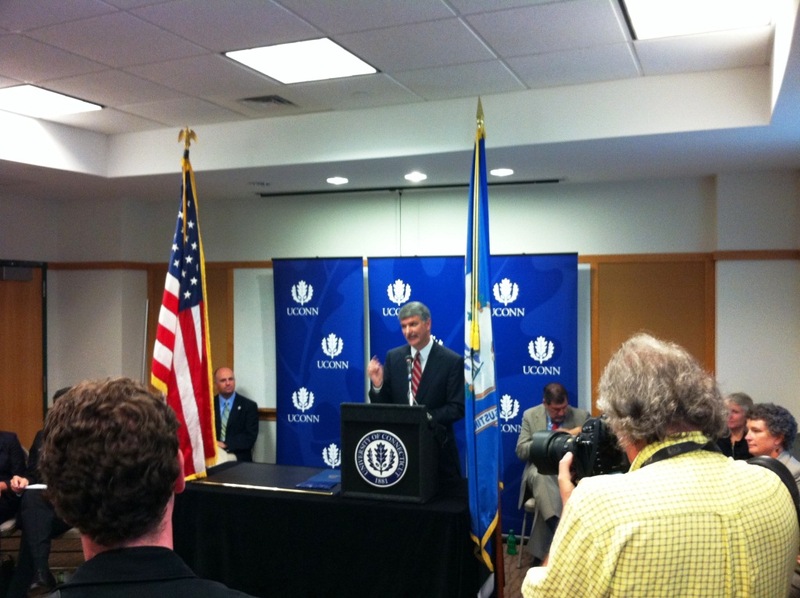 The tremendous demand to get into UCONN has resulted in the school becoming choosier. In fact, the average engineering student SAT scores for math and English has increased to over 1,300. In addition, the school further has programs to help minority and underserved students get into the school and has been playing a large role in getting younger students and even teachers excited about math and science. My readers know this is a hot button issue for me – in order for the US to compete globally, we need to simultaneously improve schools while getting kids excited more about math and science than TV. Check out my past posts, US Schools Must Improve and Global Unrest is Tech’s Fault for more. In case you are rusty on your elementary school assignment of memorizing state facts, Connecticut is known for some reason as the Nutmeg State and is pretty small – you can drive from one end to the other in a few hours and we were once known for our insurance industry. And yes, we still have a number of these companies based in Hartford, our state’s capital. In the last decade however, one of our fastest-growing segments has been hedge funds located in lower Fairfield County – especially in the cities of Greenwich and Stamford. We certainly benefit greatly from the fact we are located between Boston and New York and we have a relatively solid railroad system connecting us via high-speed train to most major east coast cities. 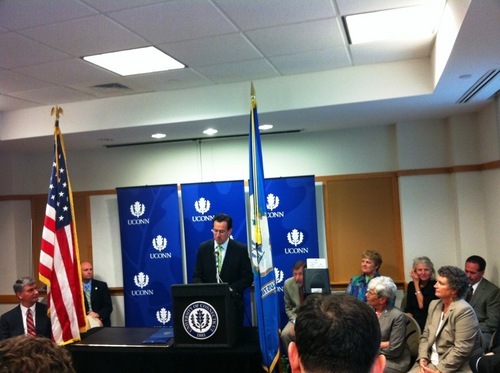 After my meeting with faculty, I had a chance to witness a historic bill signing by Governor Dan Malloy which allows $18M in bonding to be used to cover the initial design and development of a technology park whose goal will be to allow companies of all sizes to more rapidly collaborate with UCONN and in the process bring new products to market more quickly and create new jobs. 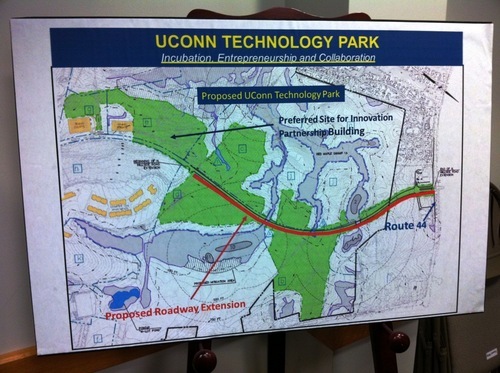 A 300-acre parcel of land is the site for the Tech Park anchor facility known as the Innovation Partnership or IP building which is expected to be constructed by 2015. 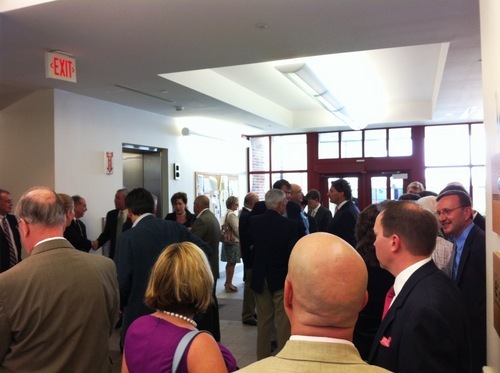 The Tech Park’s laboratories will feature highly-specialized equipment not readily available to industry. The park is designed to encourage the development of startup companies, as world-class University researchers and scholars recruited through a new “Innovation Partners Eminent Faculty Program” work side-by-side with top industry scientists and business entrepreneurs to explore innovative ideas in manufacturing and advanced product development in such areas as aerospace, defense, biotechnology, energy, and the environment. The governor mentioned Connecticut has seen a 22 year trend in job losses and he believes this news will reverse the trend. The school cites a study saying the park will create 1,200 jobs in the first ten years and 2,800 over twenty. Critics will tell you that current and past administrations are responsible for the job losses in Connecticut. After all, the state has high gasoline taxes as well as relatively high income taxes which have been steadily increasing this decade. Even Governor Malloy (pictured directly above) raised income tax rates retroactively just a few weeks ago. But hopefully if this new tech park can launch a few successful mega-companies, the trend will be reversed with a slew of spin-offs looking to the UCONN campus, not as a place where cow-tipping is the most exciting pastime but one where the next generation of high-tech companies should be launched. As a UCONN graduate and someone who has had the pleasure of working with dozens of my fellow alumni over the years, I can say that UCONN grads are really well-qualified for the workplace. They are typically hard working, sharp and don’t have the pretentiousness of students who graduate from Ivy League institutions. In other words, you typically won't hear them say something is "not their job." And for me, being in the tech space, witnessing all of the innovation coming out of Silicon Valley, I have always wished for more companies I write about to be based in my own home state. What I wonder now is if this initiative will also create more web-based companies and similarly ones specializing in information technology. After all, with all the tech graduates in Massachusetts and with UCONN investing more in its tech programs and collaborating more with industry, the only thing left to do is to find the money to fund a slew of new entrepreneurs. The good news is, Silicon Alley in New York has shown that New York money can indeed yield a slew of successful tech companies on our coast. Now, the question worth asking is, how long will it take for some of this New York and even west coast money to find its way into the hands of new companies looking to leverage UCONN’s human capital to launch what will hopefully become a well-known and fast-growing Nutmeg-Tech-Zone?